For many immigrants arriving in New York City around the turn of the century, Lower East Side became their new home. 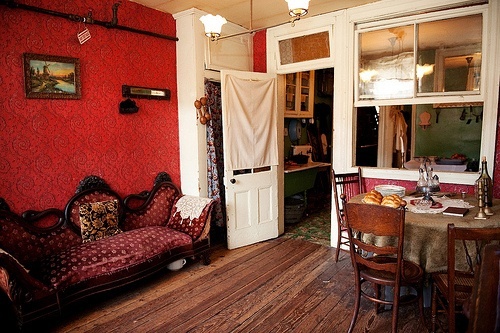 At 97 Orchard Street, the Tenement Museum is a visual reminder of how these newcomers adapted to working and living in America. Paying a visit to this museum is like opening up a time capsule. Built at the start of the Civil War, the Tenement Museum was once a single apartment building that housed nearly 7,000 working class tenants until the last tenant left in 1941 (the property’s owner stopped using it for apartments in 1935 due to new building codes). The building was left to rot for about 50 years until the museum’s founders discovered it by chance in 1988 while scoping out the venue. Thanks to the diligence of researchers, and with original fixtures like wallpaper still intact, six apartments have been restored to reflect the different periods and different families who stayed in them. Visits are led by tour guides who start from the museum’s Visitors Center at 103 Orchard Street, right around the corner from the tenement. You don’t see the entire tenement from top to bottom; just only the floor of the tour(s) you purchased. Since the four-story building is set as how it would have looked in its heyday, the lower entrance at the ground floor is dimly lit. You then walk up a staircase to get to whichever apartment tour your ticket is for. These tours not just take you into people’s homes, but also into their lives and struggles. Keeping their balances between work, family, and even religion. Fitting in. Adapting American standards of living, and how they would shake up family dynamics. Here, the old saying “if these walls could talk” is an understatement. Families that lived here in the late 18th and early 19th centuries originally came from Ireland, Sicily, Greece and Eastern Europe. Their personal stories are touching and eye-opening. One family ran a clothing business in their living room, putting in long hours. Another mourned the loss of their child. In all, living space was tight, and at one time tenants had to go outside to wash up or repeated bring buckets of water back upstairs. And to use outhouses. Each apartment is furnished with pieces reflecting its period. Some items that have been found in the tenement during excavation are shown in display cases. The two tours I went on — and highly recommend — are Sweatshop Workers (which introduces the Levine family, who ran a garment workshop) and Irish Outsiders (which I chose due to being the daughter of an Irish immigrant). 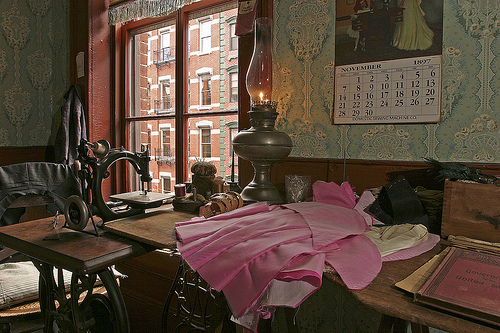 There is also a children’s tour, in which an interpreter plays a 14-year-old girl who lived in the tenement in 1914. Another surprise you might find on these tours is hearing personal stories from fellow visitors. On my Sweatshop Workers tour, a man in my group talked about his great-grandfather, who also had worked in the garment industry. As a young boy, that man was a “runner.” He had to drape piles on fabric on his shoulder and haul materials back and forth from shop to shop, perhaps like an employee that the Levin family had. 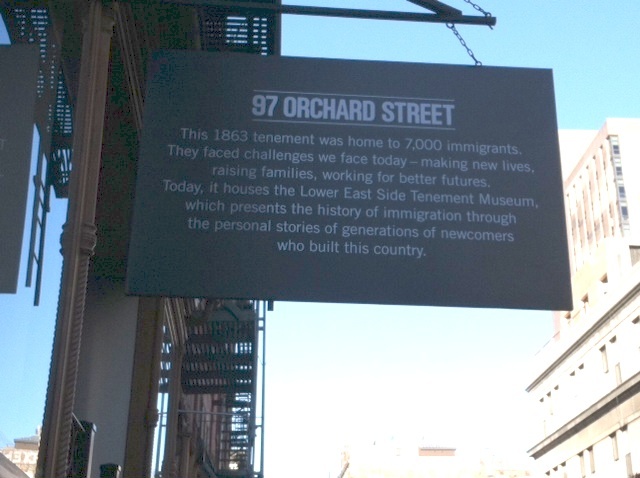 In all, what you will hear and see at the Tenement Museum is a living legacy to all immigrants. You might even be able to relate with your family history. 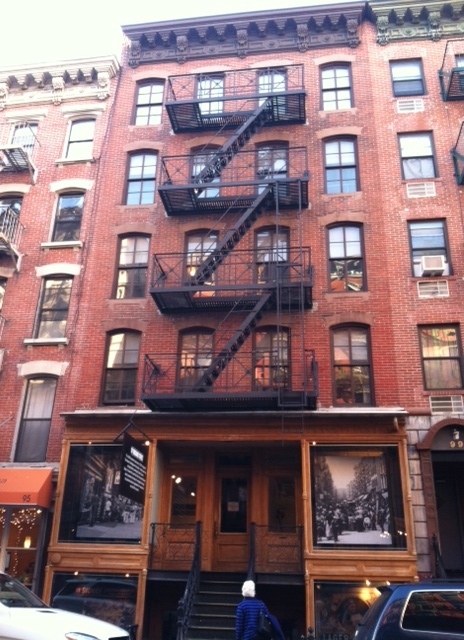 Editor’s Note: No photography is permitted inside the Tenement Museum. The photos shown here come from the museum’s Flickr account and have been given the correct photo credit. I thank the museum for access to these images. This entry was posted in History, New York, New York City, North America, Personal Interests, United States and tagged immigrants on the Lower East Side, Lower East Side New York City, museums on the Lower East Side, Tenement Museum, The Tenement Museum, what to see on the Lower East Side, where to go on the Lower East Side on February 8, 2014 by She Is Going Places.